The moment millions of fans all cried out in terror and were suddenly silenced. This movie is difficult for me to revisit. I originally watched the prequel saga as a young, impressionable kid, and back then, I loved it. Somehow, the terribly written dialogue didn’t phase me; I didn’t even notice. The fight scenes were awesome to behold and they set my little 9-year-old brain on fire with beautiful fantasies of jumping around with a lightsaber in my hand, splitting droids in half with a single swing right and left. I didn’t see what I see now: the complicated choreography left all of the conflicts emotionless and hollow, Yoda’s crazy fight at the end that doesn’t have the same magic it had when I first watched it. But there are still glimmers of brilliance in this movie that I can still see today that makes me wonder how great it could have been with just a few changes. A story exploring the origins of Darth Vader and how he became one of the most iconic villains in all of cinema sounds like a fantastic idea. Unfortunately, in practice, it completely fell apart due to the incompetence of several individuals, George Lucas foremost among them. The prequels are actually a fascinating study of the danger of one individual having absolute creative control of a project, surrounding himself with yes-men who wouldn’t dare question the choices the man who crafted the most well known sci-fi saga of all time. But one of the biggest contributing factors to what made the original trilogy so great was because so few people had faith in Lucas, at least at the beginning. Reading Lucas’s original ideas for the original trilogy, like having Han be an alien, makes it clear that while the man has great core ideas, they can get bogged down in some very questionable production decisions, and having no one around to say “no” to him can lead to some very strange, and usually terrible, roads. Attack of the Clones is the best example of this. Attack of the Clones is arguably the worst of the entire Star Wars movie saga, and I am including the terrible animated movie The Clone Wars (which I saw in theaters) in that lineup. The real reason it is the worst however, is because at a few points in the movie, you can see how good it could have been. 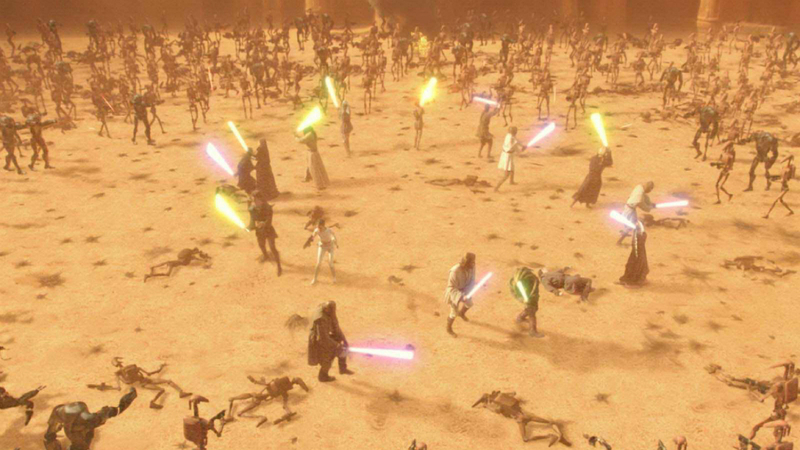 The scene where Anakin goes to save his mother and ends up killing all of the sand people is actually one of my favorite Star Wars scenes, making it all the more frustrating that it is surrounded by such mediocrity. Another highlight is how the relationship between Anakin and Obi-wan is never fully explored in any of the movies, despite it being one of the most interesting dynamics. Jango Fett steals the show in his few scenes, but he is used so little and is killed so quickly that he doesn’t make as much of an impact as Boba Fett did in the original trilogy. But while these few things are good, the rest of the movie is so bad, it is hard to even notice the good parts. The often-ridiculed romance storyline is just as bad as it is made out to be, filled with cliches and painfully angsty dialogue that is honestly on the same level of The Room. The acting is all over the place, though, admittedly, a Shakespearian actor would have a hard time doing anything good with that script. The action is ok, but as I mentioned earlier, it is lacking the wonderful emotion and charm of the original trilogy’s fight scenes, but at the very least it is fun to watch. The plot feels a bit like a house made of sticks. It seems ok at first glance but completely falls apart with the slightest push. 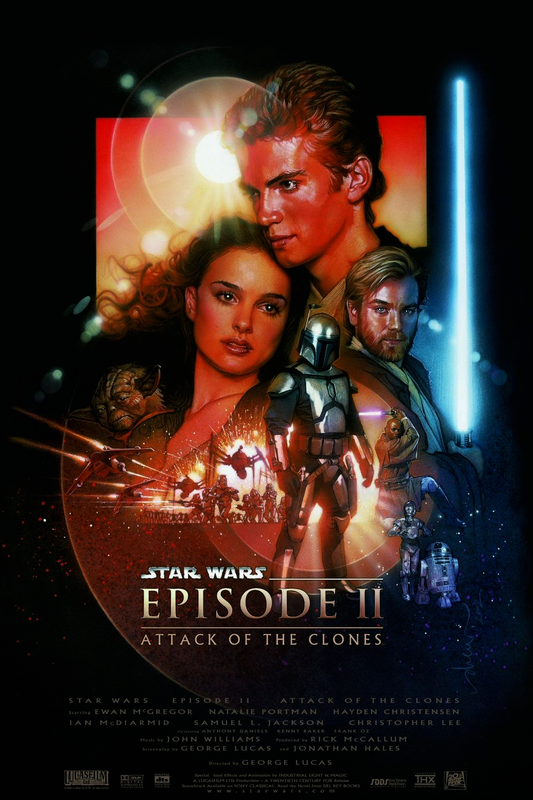 Questions as simple as, “Why is this movie called Attack of the Clones when the actual attack only lasts a few minutes?” aren’t really answered, and the characters rarely seem to have any idea what they are doing at any given time. Attack of the Clones is a textbook example of wasted opportunity, and it is my profound hope that The Force Awakens tries to keep as far away from the mistakes of this mess as possible. J.J. Abrams seems to be set up as the new George Lucas on this trilogy, so he should be sure to avoid Lucas’s mistakes of refusing to listen to others’ input. Hiring a good writer or two to help out with the script wouldn’t hurt either. Stay tuned as we conclude our Journey to ‘Star Wars’ series with Revenge of the Sith coming up next. Until next time, may the Force be with you. Is this the worst ‘Star Wars’ movie? What is your favorite lightsaber battle? Tweet me @adam_mcconnell. And be sure to follow us @YouNerded.